Each year Sardinia hosts many tourists from all over the world, its landscapes, beaches and sights of uncontaminated nature are a great attraction for many. Here it is the best tourist village in Sardinia that will welcome you for your holidays: Camping Tonnara. Located in Sant'Antico, in the south west of the large island, overlooking Cala Sapone, this tourist village in Sardinia has a unique position to enjoy the Mediterranean sea in all its nuances. In fact, Tonnara is placed directly on the coast that consists of sandy beaches and beautiful coves. What's better than watching the most beautiful sunset in the world, lying on a comfortable sunbed on the beach and hug your sweetie? This tourist village in Sardinia is the ideal setting for your perfect holiday, a hint of romance in the evening and wonderful relaxation during the day: breathtaking suntan, fun swimming in the waves, walks in mountains, shopping in the downtown streets. .. Enjoy all these moments, recharge your energy to deal with all the commitments that await you! Booking in advance you can take advantage of great deals offered by our tourist village in Sardinia: 7 nights for the price of 6, discounts from 10% to 30% ... etc. Please contact us for any information, by visiting our website you can view all our accommodations and the images of the beautiful landscape that surrounds this tourist village in Sardinia ... we have no doubt that you'll be enchanted! We guarantee that at Camping Tonnara you will never hear your children exclaim the famous words "what a bore"! Tourist village in Sardinia: which accommodation to choose for your holiday? At Camping Tonnara we provide our guests with various housing solutions, including pitches, mobile homes, bungalows, bungalow tents. deluxe tents, coco sweet tents. We invite you to contact us at any time for information on the various proposals: we will be happy to answer all your requests and fulfill your every need, so that your camping experience in Sardinia can be - and remain for a long time – in the book of your dearest memories. We inform you, just now and here, that Camping-Village Tonnara will reopen on the occasion of Easter, and precisely on Saturday 20th April. We are ready to welcome you with care, professionalism and friendliness. Oh, we were forgetting something very important: in our tourist village in Sardinia even your dear four-legged friends are welcome! Read the article we wrote specifically for them! Tourist village in Sardinia for a flowering holiday! At about one hour - or slightly more - by car from our tourist village in Sardinia, there is a small village, renowned for being one of the main centers for the production of saffron, the Sardinian red gold. In this place, whose name is Turri and which rises in the heart of the flat part of Marmilla natural region, and in the Giara between the towns of Gesturi and Siddi, about 50 minutes drive from Cagliari, the event called Tulipani in Sardegna will take place for the second consecutive year in Turri, the first event in Sardinia dedicated to tulips. 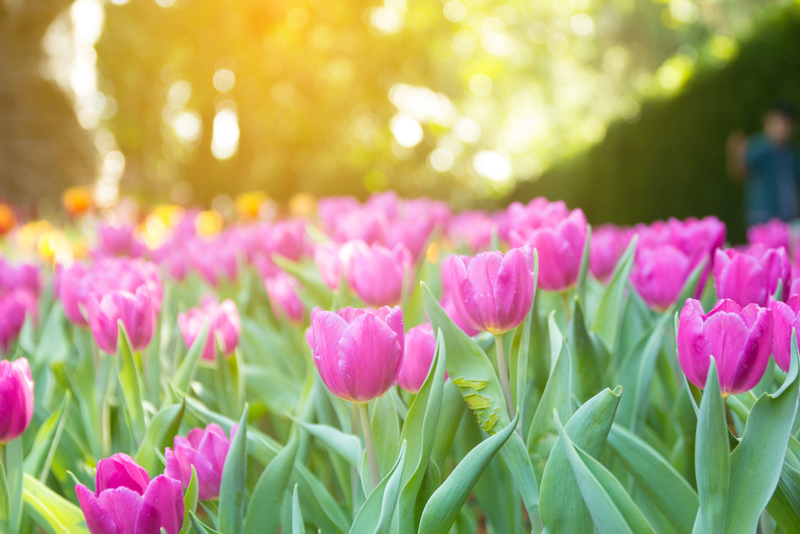 It is a large field in which 150,000 tulip bulbs have been planted and will be open to the public for the collection of flowers using the "u-pick" approach, which means that you can literally collect them. The event will last until about mid-April. The entrance ticket is 5 euros for the whole day (children and youngsters up to the age of 16 enter for free) and you will not only be able to admire thousands of tulips, but also to put in the basket that you will be given all the tulips collected by yourself, at a cost of 1.5 euros each.